Chl pneumoniae is a common pathogen and almost everyone encounters it. It is quite likely that a considerable proportion of the population is chronically but asymptomatically parasitized by this organism. Indeed, a trivial infection caught in childhood may remain dormant for life, or it may take decades to develop into a disease form. And, if it does the latter, the window of opportunity for treatment may be quite narrow. The organism tends to render the host cells it invades less effective. Complex derangements of host systems may take place, often with harmful feedback. Consider one dynamic, mechanical example. It is known that chronic Chl pneumoniae infection (as evidenced by elevated specific IgA serology) is associated with stiffening of the walls of the great arteries in young men (as evidenced by an increase in brachio-pedal pulse velocity); see this neat study: [Tasaki N, Nakajima M, Yamamoto H, Imazu M, Okimoto T, Otsuka M, Shimizu Y, Kohno N. Influence of Chlamydia pneumoniae infection on aortic stiffness in healthy young men. Atherosclerosis. 2003; 171(1): 117-22.] Baroreceptors in the aortic arch and carotid body are sensitive to the stretching of the arterial wall, and stiffening of the elastic wall of the great arteries may be expected to make these receptors less sensitive: an increase in blood-pressure would result. Paradoxically, the tone of parasitized smooth muscle in the more distant arteries may decrease, causing a fall in peripheral resistance. 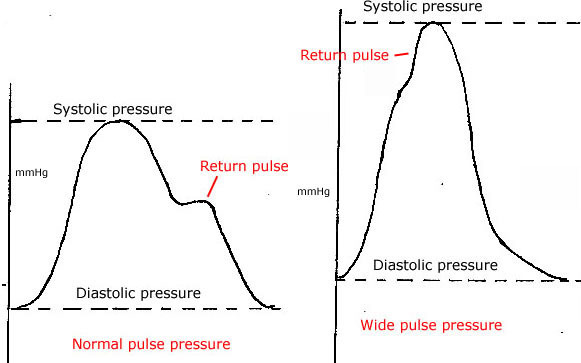 This might well account for the widening of pulse-pressure which is now known to be so dangerous. The danger comes because the coronary arteries are capable of being filled only as the cardiac muscle relaxes and the aortic valve closes; that is to say, during the approach towards diastole. In health, a return pulse to the heart  a haemodynamic echo, if you will  both softens the final closure of the leaflets of the aortic valve and fills the coronary arteries. If the great arteries are stiffened the return pulse comes back to the heart before the main pulse has subsided. Because the pulse-pressure is now wide there is insufficient pressure to fill the coronary arteries. Angina develops. Other pathologies might make this chain of events catastrophic; a narrowed and irregular coronary lumen which no longer allows a laminar flow, hypercoagulable blood, and cardiac conduction defects. It is likely, though unproven, that all these may have a Chl pneumoniae input. The situation may be further compounded by the fact that C. pneumoniae has been shown to parasitize cardiac muscle cells. Myocardial infarction associated with such parasitism tends to have a worse outcome. [Spagnoli LG, Pucci S et al. Persistent Chlamydia pneumoniae Infection of Cardiomyocytes Is Correlated with Fatal Myocardial Infarction. Am J Pathol 2007 170 (1) 33-42] There may be several reasons for this. Firstly, chlamydiae may compromise myocyte function by inducing mitochondrial stress; secondly, the direct stealing of host ATP will further exhaust myocytes; thirdly, the presence of C. pneumoniae is strongly associated with a T-cell inflammatory infiltrate. The authors of this very readable paper conclude: "Our results suggest that C. pneumoniae may underlie both coronary and myocardial vulnerabilities in patients who died of AMI and corroborate the notion that C. pneumoniae may act by reducing cardiac reserves, thus worsening the ischemic burden of myocardium." Indeed, C. pneumoniae infection has been associated with acute myocarditis: [Pao-Tsuan Kao and Chin-Yen Chiang, Fulminant Myocarditis due to Chlamydia pneumoniae complicated with Peripheral Gangrene and Cerebral Infarction: A Case Report. J Intern Med Taiwan 2009 20: 155-161] These authors review reported cases of myocarditis associated with C. pneumoniae. Infection with C. pneumoniae has been associated with dilated cardiomyopthy [Song H, et al. Dilated cardiomyopathy and Chlamydia pneumoniae infection. Heart. 2001 Oct;86 (4):456-8. letter.] This chronic but potentially fatal condition is characterised by a weakening, thinning and stretching of the muscular wall of the left ventricle, rendering its function inefficient; this results in congestive cardiac failure and pulmonary oedema. To conclude, then, it appears that C. pneumoniae, by reason of its multitudinous activity inside host cells of many types, can insidiously compound an already severe pathology.